Update: Why should Ricky Ponting [Images] not be banned, for a period of five Tests, for unfair practices that contravene the spirit of cricket? Think back to September 2003, and the Pakistan-Bangladesh series. Then Pakistan captain Rashid Latif was docked for claiming a catch, when the ball had touched the ground. He was suspended for five games -- effectively missing the entire one day series between the two sides. On that occasion, the match referee while handing out his sentence said: "As captain a lot of responsibility falls of Rashid Latif and he committed a serious offence by claiming that (unfair) catch which constitutes unfair play and a level-three offence of ICC [Images] code of conduct (offensive and penalties). Therefore, the Pakistani captain shall be banned for five one-day internationals." The match referee was -- surprise, surprise -- Mike Procter no less; the same official currently in the hot seat in the India versus Australia series. So, again -- if the BCCI is serious about "upholding the honor" of the team and the country, should it not file, with irrefutable video evidence (external link) available by making a simple call to the broadcasters, a complaint against Ponting for unfairly claiming a catch, and further defending his "integrity" and insisting that the catch was 100 per cent fair? Or does responsibility for ensuring that the game is played in the right spirit merely vest with some captains, but not with others? In the aftermath of the dramatic events of Sunday, during the last day's play in the second Test between India and Australia in Sydney, Australian captain Ricky Ponting has had much to say-- and the bulk of his statements constitute a defence of his own integrity. Ponting, then fielding at silly point, had dived to hold a ball that ballooned off Mahendra Singh Dhoni's [Images] pads; he got to his feet and vociferously claimed the catch, though replays at the time indicated he had grounded the ball. 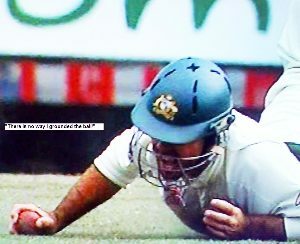 That could have been justified as happening in the heat of the moment - but later in the day, after play, and with the benefit of video replays to draw from, Ponting not only maintained that he had caught it clean, but suggested that an Indian journalist who had questioned the catch "shouldn't be standing there". "There's no way I grounded that ball," Ponting told a press conference. "If you're actually questioning my integrity in the game, then you shouldn't be standing there." A while later, he reiterated his conviction that the catch was clean. "I'm saying I'm 100% sure I would have caught that catch off Dhoni," Ponting said. "As it turned out it was given not out anyway, am I right or wrong?" What is startling about the picture is not that the ball is touching the ground, but that a prone Ponting actually has his eye directed towards it. In other words, Ponting clearly had to have been aware that he had grounded the catch - and yet, even with the benefit of hindsight, he not only claims otherwise, but suggests that his integrity cannot be questioned.